Description: This is a shrub with multiple narrow trunks and ascending to slightly spreading branches. The bark of trunks and branches is gray, while twigs are brown and glabrous with white lenticels. Young non-woody shoots are green to reddish green and glabrous. 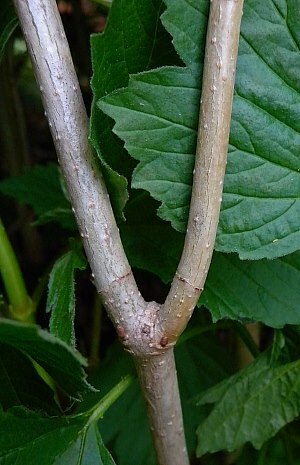 Pairs of opposite leaves occur along the shoots and twigs. 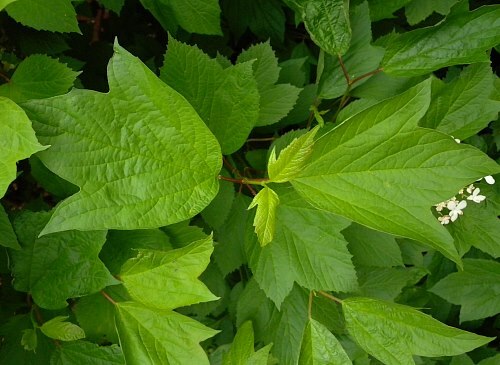 Individual leaves are 2-4" long and nearly as much across (oval in outline); they are palmately 3-lobed, and sparingly dentate to smooth along their margins. There are either a few large teeth or they are absent altogether. The shallow to moderately deep lobes have pointed tips, while the base of each leaf is rounded. The upper leaf surface is medium green and hairless, while the lower surface is pale green and either hairless or hairy along the veins. The slender petioles are ¾-1½" long, light green to red, and glabrous. Near the apex of each petiole where it joins the leaf, there are 1-2 pairs of tiny glands with rounded tops. These glands may become deformed or nearly disappear as the season progresses. At the base of each petiole, there is a pair of simple stipules; they are deciduous and insignificant. Some of the upper and outer shoots terminate in flat-headed panicles (cymes) of white flowers. Individual panicles span about 2-4" across; their branches are light green to red and glabrous. Along the outer margin of each panicle, there are several sterile flowers about ¾" across. Each sterile flower has 5 white spreading petals and a short tubular calyx that is 5-toothed and green. Within the interior of each panicle, there are many fertile flowers about ¼" across. Each fertile flower has 5 white spreading petals, a short tubular calyx that is 5-toothed and green, 5 stamens, and a pistil. The blooming period occurs during late spring to early summer and lasts about 3-4 weeks. The floral scent is unpleasant. The fertile flowers are replaced by one-seeded drupes that are about 1/3" (8 mm.) across. They become bright red at maturity during late summer or early fall. Individual seeds are about 5 mm. across, nearly orbicular in shape, and flattened. The flesh of the drupes is tart. The root system is woody and branching. During autumn, the deciduous leaves become bright red. Cultivation: The preference is full sun to light shade, wet to moist conditions, and a boreal climate with cool to moderately warm summers. The soil should contain decaying organic matter to retain moisture. Range & Habitat: The native American Cranberry Bush is a rare shrub that is found in widely scattered areas in the upper half of Illinois (see Distribution Map). Habitats consist of cool moist woodlands, streambanks in wooded areas, sandy swamps, soggy thickets, edges of sandy marshes, forested bogs, and roadside ditches. American Cranberry Bush is occasionally cultivated as an ornamental landscape plant. Outside of cultivation, this shrub is usually found in high quality wetlands where the native flora is still intact. Faunal Associations: The nectar and pollen of the flowers attract primarily small bees (mostly Halictid & Andrenid bees), Syrphid flies and many other flies, and miscellaneous beetles. Both American Cranberry Bush and European Cranberry Bush are preferred food plants of the moth, Oreta rosea (Rose Hooktip). More generally, see the Moth Table for a list of the moth caterpillars that feed on Viburnum spp. The caterpillars of the butterfly, Celastrina ladon ladon (Spring Azure), feed on the flowers and buds of these shrubs. Other insect feeders include Pyrrhalta viburni (Viburnum Leaf Beetle), the wood-boring larvae of Oberea schaumi (Long-Horned Beetle sp. ), and various plant bugs (Lygidea viburni, Lygocoris omnivagus, & Lygocoris viburni). The following aphids have been found on American Cranberry Bush: Aphis rumicis, Aphis viburniphila, and Ceruraphis viburnicola. The bright red fruit is eaten by the Ruffed Grouse and other birds, particularly during the winter when other sources of food are scarce. White-Tailed Deer browse on the twigs and leaves. Photographic Location: Along a building of the Illinois Natural History Survey in Champaign, Illinois.. Comments: American Cranberry Bush has attractive flowers, foliage, drupes, and autumn coloration. Because birds consume the drupes sparingly, they often persist during the winter. The edible drupes have a tart flavor that is similar to cranberries. However, it is best to use them before a hard frost occurs, which can degrade their flavor. 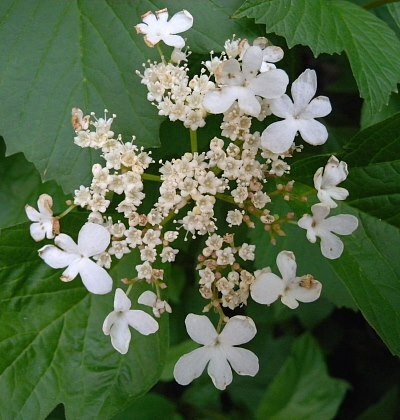 American Cranberry Bush is very similar to fertile cultivars of European Cranberry Bush (Viburnum opulus), and it is sometimes regarded as a variety of this latter shrub (Viburnum opulus americanum). The European Cranberry Bush occasionally escapes from cultivation. It prefers habitats that are similar to those of American Cranberry Bush and it is potentially invasive. These two shrubs differ from each other as follows: 1) American Cranberry Bush has petiolar glands with convex upper surfaces, while the petiolar glands of European Cranberry Bush have concave upper surfaces; 2) the stipules of American Cranberry Bush are simple and deciduous, while the stipules of European Cranberry Bush are bristly and more persistent; 3) the leaves of American Cranberry Bush have fewer teeth (or no teeth) along their margins than the leaves of European Cranberry Bush; and 4) the drupes of American Cranberry Bush are reportedly less sour and bitter than those of European Cranberry Bush.